My father worked as a printing pressman at Eastern Color Printing, the company that invented the modern comic book. When I was growing up, the company printed a slew of comic books and the Sunday funnies for about a dozen newspapers in the Northeast. After work, my father brought home copies of whatever was printed that day. The comic books were coverless because the glossy covers were printed and stapled to the four-color interior pages at a different plant. Typically, the comic books my father brought home consisted of two sheets of newsprint. 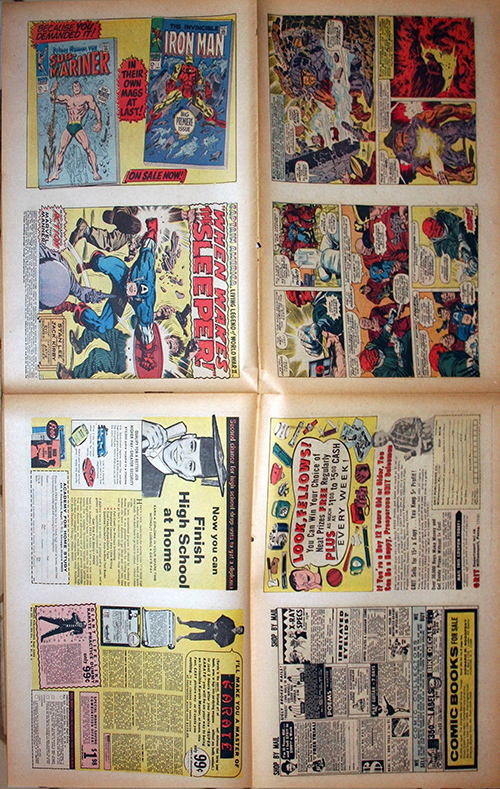 Eight pages of the comic book were printed on each side of the two sheets (see photo above of Captain America #101) for a total of 32 pages. The two sheets came off the printing press collated and folded into two-pages flat, ready to be trimmed, covered and bound (stapled) at the other plant. My sister and I quickly learned how to use a table knife to slice open those folded sheets of newsprint so we could read the comic book. Max Gaines created the modern comic book while working for Eastern Color. About 30 years later, his son, Bill Gaines, co-founded MAD Magazine. I encountered MAD for the first time when my family piled into the Chevy and drove to Storrs to visit my uncle who was attending UCONN. In his dorm room was the September 1960 issue of MAD, with a cover that suggested that the magazine could be used as a fly swatter. My 9-year-old mind thought that the idea behind the cover was brilliant and I was hooked. I collected a few back issues that my uncle was ready to discard and I began spending my allowance buying the magazine whenever it appeared on the rack at the Palace News. Anyway, one day, my father came home from work, handed me a stack of Sunday funny sections and said, "Surprise!" I assumed, but never could confirm that the Bill Gaines-Max Gaines-Eastern Color connection had something to do with MAD hiring Eastern Color to print the insert. And as it turned out, Eastern Color printed all the subsequent MAD inserts of the four-color newsprint variety including Sing Along With MAD (for More Trash From MAD #4), MAD Protest Signs (for Worst #7) and "A Full-Color 'Pop Art-Op Art' Life-Size Picture of Alfred E. Neuman" (for More Trash #8). From a very early age, I was fascinated with the product my father brought home. I even tried recreating the four-color printing process by drawing the tiny dots that made up the images in the comic books. I quickly realized that trying to create a comic book by drawing those dots would take forever so I dropped that experiment, but I continued drawing humor in a jugular vein and eventually drew about a dozen issues of my own version of MAD, which I called Crazy. I was born in late 1950 and grew up with a love for comic books, often sitting for hours at Murphy's, Woolworth's, McCrory's, or Kahn's Department store in Northern Virginia, reading all the new releases in order to select the few that I would buy for 10 cents each. Mad Magazine was a staple of my insatiable diet. In my circle in Jr. High School, if you could not quote the latest Mad, you were ostracized until the next issue came out. Those were heady years. Spy versus Spy, anyone? Were you for the Black spy, or the White spy? If this does not register with some of you, then you missed the heyday of Comics. Stana, if you still have some of your Dad's comic pages, seriously consider donating them to the Smithsonian! I do have a couple hundred coverless, just off-the-printing-press comic books... mostly Marvel comics from the 1960's including a some first issues (Fantastic Four #1, Spiderman #1, Thor #1, X-Men #1, etc). Years ago, I donated a book to the Connecticut Historical Society when they were doing their exhibit about comic books in our state (Connecticut had about a half-dozen companies producing comic books in the mid-20th century). My uncle worked at Condé Nast publisher and used to bring home Scientific America and other magazines. Well, It's Deja-vu all over again! I spent the later part of this day peruseing the 60 year anthology of MAD. I attribute MAD MAG for fostering in me an irreverent sense of humor, and a disdain and disbelief of 'false authority figures' prevalent here in the south. One of the unwritten school lessons, here in the Cottonmill/ sharecropper South: "Always respect and believe the RICH, WHITE, BOSS-MAN/PREACHER MAN, no matter what he says.... (How's that working for you now?)". It turns out that MAD founder. Gaines was SUED over the songs as copyright infringement. The case made it to the Supreme Court, where the appellate ruling was upheld; 'basically one cannot copyright "iambic pentameter". MAD and Gaines had prevailed. I own a complete run of Mad magazines and still have a subscription to the mag. When I was maybe 6 or 7, I started my love of comics. I somehow discovered MAD but my mother disapproved. BUT I had to take an iron shot every couple of weeks, which I hated (I STILL hate needles, hence my unpierced ears). As a reward for not complaining, I could get MAD when it came out. Eventually she figured out that it wasn't going to turn me to the Dark Side. I believe that there are many little, insignificant items in life that have large, consequential results. My main hobby is cardmodels. I think I can trace that back to the Mad Zeppelin, a Worst Of bonus. I wish I could get another! And I wonder if there's a connection between MAD and your femside... maybe some drag event in one of their parodies. I know we've both been captivated by things like Jimmy Olsen dressing up (more than once). I bet if you followed this thread you'd find the comic/MAD infusion is more widespread than just having a subscription. Also, that Self-Portrait dress is magnificent.